The New Madrid and Wabash Valley seismic zones affect 8 states – Illinois, Indiana, Missouri, Kentucky, Tennessee, Arkansas, Mississippi and Alabama. A series of very large magnitude earthquakes and hundreds of aftershocks occurred in the New Madrid region in 1811 and 1812, causing havoc for the small population of the time. A magnitude 5.8 earthquake in the Central Virginia Seismic Zone in August of 2011 shook Mineral, Virginia and was felt over much of the Eastern United States. The earthquake shutdown the North Anna Nuclear Power Plant and caused damage in Virginia, Washington DC and beyond. Seismic zones in the East can generate significant earthquakes and tend to surprise people who are not accustomed to earthquakes. The briefing will discuss efforts to understand earthquakes in the East and to reduce risks to life, property and infrastructure. On Wednesday / March 7th, Dr. Ross Stein, a senior scientist with the Earthquake Science Center in Menlo Park, will visit the USGS Advanced Systems Center in Reston, VA. At 10:00 AM he will give a talk about the Global Earthquake Model (GEM), an international public-private partnership building a seismic hazard and risk model for the world, in which USGS scientists are deeply involved. GEM <http://www.globalquakemodel.org/> manages a collaborative effort aimed at developing and deploying tools and resources for earthquake risk assessment worldwide. It aims to create global standards for seismic hazard and risk assessment, and to attack the problems that no risk models exist for many vulnerable parts of the world, and even where models do exist, they are often inaccessible. Under GEM, hundreds of organizations and individual experts, professionals and practitioners are working together on uniform global databases, methodologies, tools and open-source software. GEM grew out of a $30K USGS Venture Cap grant in 2006, and now has pledges of $30M for its five-year program. Ross was a founding member of GEM, and now chairs its Scientific Advisory Board. The United States recently became a member nation of GEM, represented by the USAID Office of Foreign Disaster Assistance (OFDA), which provides funding to GEM. The talk will be given in room 3A409 (aka Chief Geologist's Conference Room), at 10:00 AM tomorrow. HAZUS-MH 2.1 is shipping ! It's official as of 2/21/2012 @ 07:39AM ... HAZUS.org received the email from FEMA that the long awaited 32/64 bit HAZUS-MH 2.1 is now shipping! Other parts of the FEMA HAZUS web pages are not reflecting the availability of HAZUS-MH 2.1 but they will no doubt soon catch up. > HAZUS-MH 2.1 is now compatible with Windows 7 (32 and 64 bit) Service Pack 1, and Windows XP Service Pack 3. 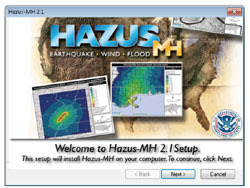 > HAZUS-MH 2.1 is now compatible with ArcGIS 10.0 Service Pack 2. Hazus-MH 2.1 runs under Service Pack 3 but is not 100% certified. > The underlying database engine has been upgraded to SQL Server Express 2008 R2. Flood & Hurricane) have been adjusted to provide greater consistency. > IMPLAN default data is no longer provided with HAZUS-MH. Users should supply their own data for Indirect Economic Analyses. > New damage and loss of use functions have been developed for hospitals, schools, and fire stations in the Essential Facilities portion of the Hurricane Module. > The windfields for several category 4 and 5 historical storms have been re-analyzed and updated in the Hurricane Module. > In recognition of the uncertainties inherent in hurricane forecasts, the Coastal Surge analysis capability has been disabled for forecast/advisories issued more than 24 hours before the expected time of landfall. ~The 2 and 5 year return period extrapolations have been removed from the methodology. ~ The 200 year return period has been replaced by a 25 year return period in the methodology. 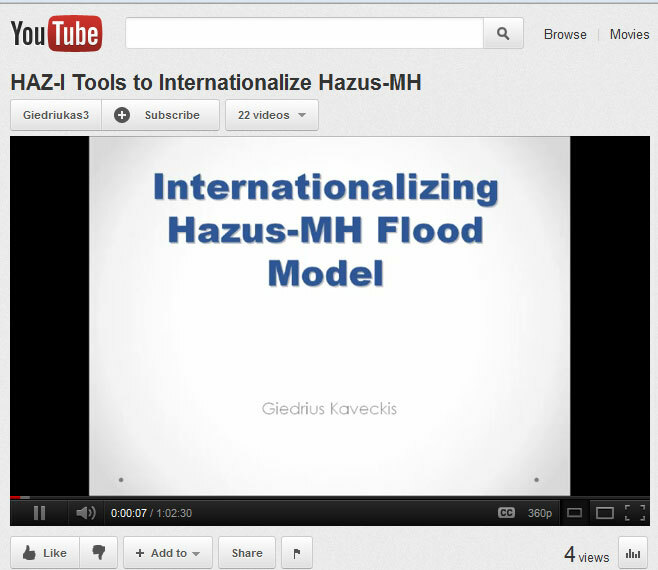 ~ Refer to the HAZUS –MH 2.1 Flood Technical Manual for complete details on the Flood AAL methodology. > A riverine level 1 study region automation feature has been added to the Flood Module. > The Flood Module is now processing Manning’s roughness coefficients dynamically based on a LULC grid as part of the Develop Stream Network process. > The Flood Module Hydraulics process has been optimized for scenarios where a suite of return periods is being analyzed. > Occupancy Mapping Schemes have been updated for the Earthquake Module. > The Earthquake Ground Motion Module has been updated to use the latest USGS Next Generation Attenuation (NGA) functions. > The Earthquake Module now includes a feature to analyze study regions greater than the 8 GB limit of SQL Server Express. The discussion in the paper on the perceptions of the folks living behind levees in the California Sacramento-San Joaquin Delta was most interesting. FYI ... Stefan Zink who was then at Michael Baker Jr., Imc. presented a paper at the March 4, 2008 meeting of the Bay Area HAZUS User Group that might also be of interested to the flood community. This paper addresses some of the problems in trying to use HAZUS-MH to model levee related flooding in the Sacramento region. This presentation discusses a simplified approach (4 steps) to create a HAZUS study region for international applications.